What can we learn from the way graduates are decorating their caps? For college students across the country, commencement formally marks the transition from student to graduate. Per tradition, most schools feature speakers, give out awards, organize departmental dinners – and, of course, designate caps and gowns for students to wear when they receive their diploma. But in the midst of the official pomp and circumstance, more and more graduates are adding a personal touch: They’ll decorate their graduation caps, also known as mortarboards. As a folklorist, I pay close attention to the creative ways in which people choose to express themselves, which can tell us a lot about their beliefs, perspectives and aspirations. When I attended my first University of Nevada, Las Vegas, commencement ceremony as a faculty member in 2011, it struck me how widespread the practice of decorating mortarboards had become. I wanted to learn more about how graduates were decorating their caps, what messages individuals wanted to convey and what these messages revealed, more broadly, about their college experiences. So I began gathering data on the caps from photographs, surveys and interviews. Much of it will eventually be digitally archived by the Center for Folklore Studies at The Ohio State University. While the project is still ongoing, I’ve begun to identify a few key trends. The practice of embellishing mortarboards is by no means new. 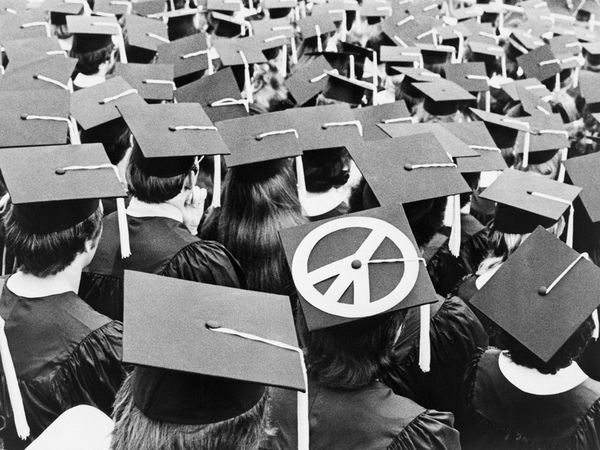 In the 1960s, some graduates would affix peace signs to the top of their caps to protest the Vietnam War. When I completed my B.A. at University of California, Berkeley, in 2003, it was not uncommon to see decorated caps atop the heads of graduates. Today, however, it seems to have become much more popular – which can probably be attributed, at least in part, to social media. As one person I interviewed put it, these caps are very “Instagrammable”: visually appealing, easy to photograph and sure to garner likes and comments. Like the graduates protesting the Vietnam War in the 1960s, today’s graduates are also making political statements. Slogans like “Black Lives Matter” or images of raised, clenched fists will appear on caps. It makes sense that people would want to announce the accomplishment of graduation, and a photo of a personalized cap posted on social media is one way to do so. Sharing images of customized caps inspires others to do the same, and so the practice spreads. Not surprisingly, many of the messages on decorated caps reaffirm the value of higher education and look optimistically to the future (“The Best is Yet to Come,” “Time to Spread Your Wings”). Others reflect school pride by including a university logo or mascot or identifying the graduate’s major or academic accomplishments. Identity often influences what appears on the caps. You’ll see students reference their family, their veteran status, their hometown, religious beliefs and personal obstacles they’ve overcome. Humor is also common. Sometimes it’s deployed to highlight the graduate’s personality or mock the formality of the occasion, with phrases like “Thanks Mom, Dad and Alcohol.” One cap had a 3-D model of a beer pong table – little cups included – affixed to it. While making a humorous pop culture reference, the student was really calling attention to her experience of being a poor college student – and the fact that she’ll be carrying significant student loan debt well into the future. It’s just one of many examples that show how graduates can creatively use the space on their mortarboards to resist the celebratory mood of commencement, questioning whether the time and money spent on a degree was really worth it (“My $35K Hat,” “Was the BS Worth the BS?”). The University of Nevada, Las Vegas, where I have collected the majority of my data so far, is among the most diverse campuses in the nation. In observing and tracking mortarboard cap decorations over the last couple of years, I have seen a marked increase in the number of caps that highlight the wearer’s racial and ethnic identities (“Black Girl Magic,” “This Xicana from El Chuco. ¡Si Pudo!”). To these graduates, it’s important to show that the procurement of a college degree is part of an ongoing family immigration story characterized by hard work and perseverance. Images of butterflies – a symbol of the immigrant rights movement – also dot many caps. A good number reference the DREAM Act and the hostile political climate immigrants and their families find themselves in. Everyone experiences college differently. For every student who spreads their wings socially or falls in love with their major, there are those who struggle to stay on top of tuition bills and keep up their grades. While all of these students end up in the same place on graduation day, a critical look at these mortarboards gives us both a glimpse into the varied paths students take to graduation and the different futures that await them.